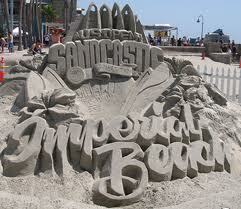 Imperial Beach California is the most southwesterly city in the continental United States. This beach is open from 7:00 a.m. to sunset everyday. 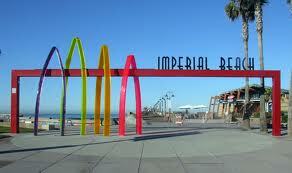 Imperial Beach is great for sunbathing, jogging, walking and swimming. Oh and building sandcastles! Every summer since the early 80s Imperial Beach has been home to the international-renown U.S. Open Sandcastle Competition. This event, which used to be a three day event, took a break for a couple years but came back with a new name. The Sun and Sea Festival (sponsored by the Port of San Diego) was a one day event in the summer of 2013. They wanted to make it more for families so instead of competing against each other, they had to master teams that worked together to do a big sandcastle. At the entrance to the Imperial Beach Pier is the Pier Plaza. There are shops, a children's playground, an outdoor eating and sitting area and a restaurant at the end of the pier. Outdoor Surfboard Museum - Many of these boards were designed by Imperial Beach natives. It is an outdoor museum where displays of surfboard silhouettes are anchored to the sidewalk that trace the history of surfboard designs and shapes throughout the history of surfing. It is located on a stretch of road between 3rd Street and Seacoast Drive. Tijuana Estuary Visitor Center is one of the few salt marshes remaining in Southern California, where over 90% of wetland habitat has been lost to development. The site is an essential breeding, feeding and nesting ground and key stopover point on the Pacific Flyway for over 370 species of migratory and native birds, including six endangered species. The Reserve offers four miles of walking trails, taking visitors into prime bird watching areas and down to the river mouth where the Tijuana River meets the Pacific Ocean. Visitors may explore the park on their own or join one of the free guided nature and bird walks on weekends. Bayshore Bikeway is a 24 mile span of bikeway that circles the San Diego Bay National Wildlife Refuge and the San Diego Bay. Currently, approximately 13 miles of bicycle paths are in use on the Bikeway. The rest of the facility consists of on-street sections designated as either bicycle lanes or bicycle routes.